View recently SOLD Gulf Shores condos in Crows Nest. Find closed price and date. 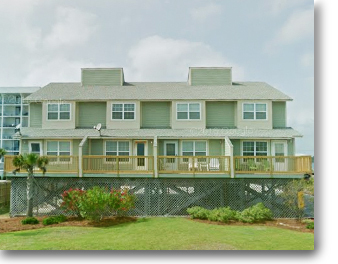 Crows Nest condominium sits directly on Little Lagoon in the West Beach area of Gulf Shores, Alabama. These condos were built in 1982 and the complex consists of 16 individual condo units. All of the units in the Beachcomber are two- or three-bedroom condos ranging in size from approximately 1,024 square feet to 1,280 square feet. The condominium is a little over 3 miles west of the Highway 59 and minutes from Gulf Shores restaurants, shopping, and entertainment. The complex offers a community pool, fishing pier, and is a short walk to the beach just across the street. Crows Nest condos are a great value for a beachside property with direct lagoon access. Looking for comprehensive details on condos for sale in Gulf Shores, AL? Visit our primary sales page to find aerial imagery, interactive Google maps, recently SOLD info for every condo in town along with links to separate condos using price, waterfront, boat slips and revenue info for each building. Also, find a recently SOLD Quick Search with all Alabama Gulf Coast condominiums listed in alphabetical order to easily access this important investment info - find a sample cash flow statement to see basic costs and help formulate this info for all other Gulf Shores condos. (This is also accessible from each condo's individual sales page along with the recently SOLD data - 2 years worth). If you have any further questions, need info or would like to schedule a private viewing for Crows Nest condominium in Gulf Shores or any other condo or property, please email info@condoinvestment.com or call (251) Area-Pro (251-273-2776) for immediate assistance.